For the man whose stunning power at the plate and blazing speed around the base path thrilled generations of Americans, the incarnation of automotive power came in the form of a 1971 Chrysler Imperial LeBaron. 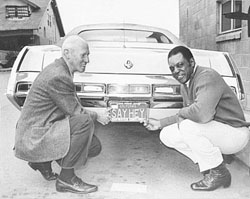 He was often seen driving around the San Francisco Bay area with his friends and teammates, including fellow 500 Home Run Club member Willie McCovey. Ken Griffey, Jr. likes to drive the same car to the park every day. If two days in a row, he doesn’t get any hits, he won’t drive that car the third day. If he doesn’t get any hits for a week, he ships the car back to his home in Florida and has a new car brought up. Or course he has no shortage of vehicles to choose from. 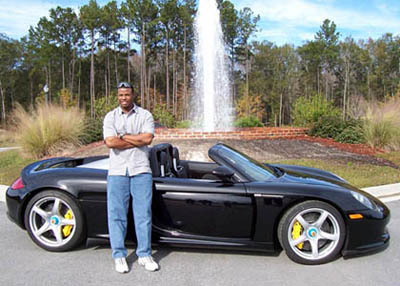 Not to be outdone by A-Rod, Ken Griffey, Jr. owns part of a Porsche dealership in Hilton Head, SC. His Carrera is his favorite car, but on black tie occasions he rolls out the $300,000 Bentley Continental GT. A few years ago, Ken took a ride with Bobby Rahal around Roebling Road Race Track (just outside of Savannah, Georgia), in Bobby’s Carrera GT at the 2005 Hilton Head Concours d’Elegance track days. It looked like he really enjoyed the ride.